Yes, that's a 12-cylinder, 600-horsepower Ferrari race car, wrapped in the same duct tape holding up the exhaust of your cousin's Kia Sephia. It was the 24 Hours of Daytona, 1971, the debut of Roger Penske's dream team with David Hobbs and Mark Donohue where the troubles would begin—one of the most famous Ferrari race cars in the world, that managed to never win a single race. Roger Penske bought this Ferrari 512, rebuilt it from the ground up, and assembled a dream team for Penske Racing. With himself in charge, John "Woody" Woodard as his chief mechanic, the analytical mind of Donohue and the endurance experience of Hobbs, Team Penske should have been a dominator. Instead, it didn't win a single race that year—making it quite possibly the unluckiest race car in history, and subsequently one of the most famous. Hobbs had been racing in Formula 5000 alongside John Surtees, and occasionally Donohue would drop by with Penske; good racing ensued, claimed Hobbs. "I beat him a few times." But in fall of 1970, Hobbs was at home in Warwickshire when he received a phone call from Dan Luginbuhl — Penske's longstanding PR man, who would go on to work for Roger for 30 long years. Luginbuhl asked, would you like to drive for Penske in this newfangled Ferrari 512 we're going to buy? Four races, with Donohue: Watkins Glen, Sebring, Daytona, and Le Mans? Say, you used to race GT40s for John Wyer, you know a thing or two about that last one, right? Why yes, of course he did. And, of course, he accepted. He went to the Dorchester Hotel in London, about two hours southeast, to meet Penske and Donohue. "Mark's only comment was, 'for an Englishman, you're not a bad guy.'" At Daytona, on Jan. 31, 1971, Penske Racing arrived with its sparkling Ferrari 512M, with its 600-hp engine by Traco Engineering and a trick refueling system that owed more to the aviation industry than anything used by a racing team. " When we arrived at Daytona, the Wyers were running the 917s for the factory. And they just had a bit of a heart attack when they saw the fuel cell! So they protested this filling method, and whoever was in charge of the course looked through the rulebook and it didn't say anything about you couldn't use them." The Sunoco-Penske Ferrari "set a trend for the way sports cars should be prepared." It was a car prepared like a surgical instrument: every panel straight and true, every surface polished that needed polishing, readied by a team that maintained obsessive attention to detail down to the creases of their uniforms. "You could eat your dinner off the footwell," suggested Hobbs. "Whole thing was immaculate." The Europeans, he said, dismissed all this as spit-and-polish. Their cars were rougher around the edges—anything else distracted from the focus on winning. Donohue shut them up when they earned pole. And Hobbs, who had been denied a chance to drive a Porsche by certain powers that were, found it very satisfying to "when we got the pole, give them the old salute." 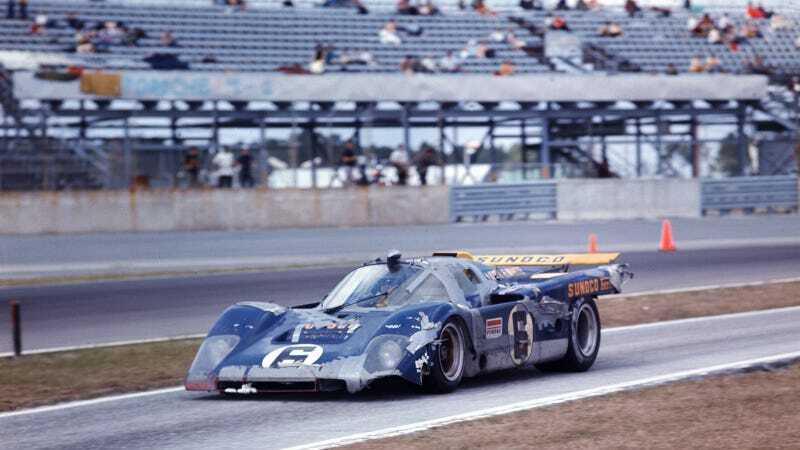 Hobbs and Donohue led the race well into the night, when around midnight, when Donohue was driving, Vic Elford in a Martini Porsche 917K spun at the banked turn three. When Donohue slowed down, "some errant 911, which we probably lapped about 50 times or something," ran into the back of the 512M. Hobbs, unaware, was attempting to get some precious rest before his stint. "In those days, you only had two drivers. We had this little caravan, and I was in there in the middle of the night, getting some rest—not that you could really get some rest, with the noose and you're all hot and sweaty. "And I woke up and was momentarily confused. Because standing in the caravan with me was Mark! And the last thing you wanted to see was your co-driver." They wrapped nearly every panel in duct tape—both front fenders, the doors, the roofline, clad in silver like a disarrayed Frankenstein. And they limped it to the end—a third-place finish, behind John Wyer's 917K and a Ferrari 512S. Elford never finished. The rest of the season was no less eventful—blown engines, angry 917s, steering shenanigans. The full story goes on, at Autoweek, including an interview with Hobbs on Petrolicious where he talks about banging his head against the roof as he flew around Sebring.